As this project comes to a close, I want thank those of you who followed along. Your little encouragements with personal messages or post likes, comments, and shares are meaningful to me. Even though I don’t respond to most of them they are appreciated. This is not an easy project to do…it takes time, it takes thought, it takes re-living some of those toughest moments of my life. However, by actually taking the time and making the effort to put my thoughts into words, somehow I seem to get new insights into some of my own thoughts and feelings, I come up with new ways to describe the experience, and I solidify some things that I’ve felt all along. I think journaling is an incredibly healing experience and these prompts are done very well. They encourage reflection in a way that brings hope and healing. I’d certainly encourage others to give it a try, whether it’s openly for the world to read or in your own private journal at home. One of the helpful things in my early grief, was to read others experiences and to know I was not alone. To know that others could feel what I was feeling and still go on to lead a happy and fulfilling life brought hope. They could offer new perspectives that seemed to help calm the sea. By sharing this project shared on social media, outside the “safety” of support groups or closed circles of bereaved parents, I hope that others can get a glimpse into the mind of someone wrestling with the aftermath of losing a child. I hope that by “normalizing” grief to some extent that it won’t seem so foreign and scary when it happens to someone we love. I hope it will make it a little easier for us all reach out with gentle compassion and some sort of understanding when people we love are grieving. I know I am not the only one to suffer. Everyone has their own personal experiences of struggle, loss, and grief. Not everyone’s struggles can be shared out loud. I hope that by telling my story and my path to healing that I am not the only one who gets something out of it. I hope that in some way sharing my experience, because I can, will touch someone else and help in their road to healing, too. You know that feeling that you get when you actually stop what you are doing to watch and appreciate a sunset…there’s something like that in this project. To stop what I’m doing and give my attention to the journey of grief does something of the same. 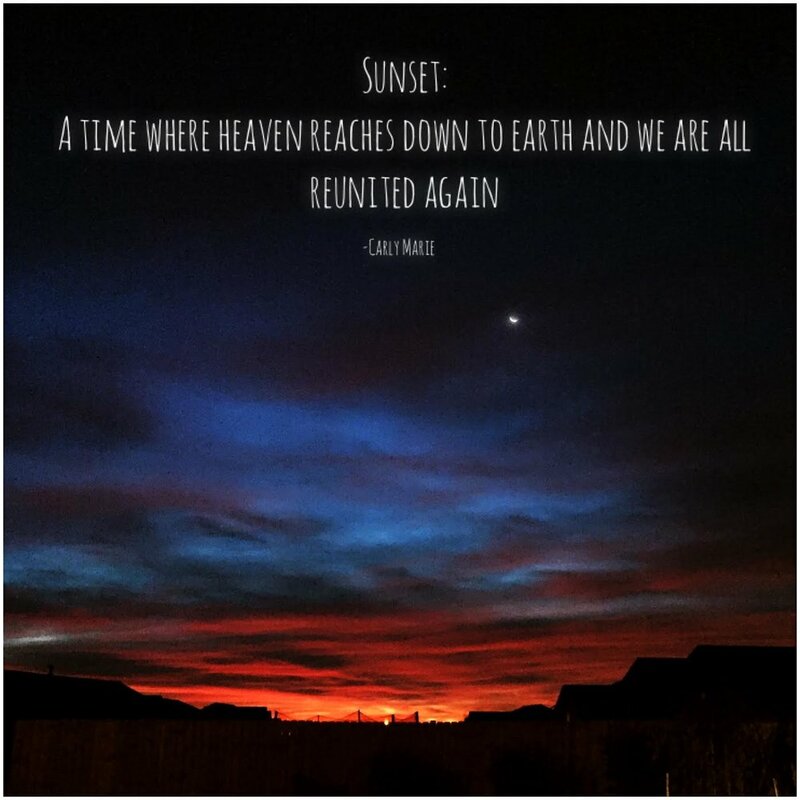 Grief, like joy and a beautiful sunset, are holy. Grief is love’s souvenir. It is our proof that we once loved—and that that love continues beyond death. When we watch a sunset, or look at a heart after loss, for that moment, we are stopping to notice that heaven has reached down to touch the earth. My promise to you is simple. I will not let your life go unnoticed. I promise to do everything in my power to make sure I am not the only one who remembers you. You were too important for that. You left your legacy on my heart and I will allow your legacy to touch the lives of others. I figured out pretty early on that there was something beneficial for me in reaching out to other people. It didn’t matter too much what it was, it was simply the effort to make the day better for someone else that brought just a glimmer of light into my dark world. In fact, I had little “Random Act of Kindness in memory of Lachlan” cards made up. I didn’t end up using very many of those. I guess I found that the outward acknowledgement of why I was doing it was not necessary. It just felt good to bring a little ray of sunshine into someone else’s day. Sometimes it was in purely random acts…dropping off a bouquet of flowers for a stranger, buying a coffee for the person in line behind me, or handing a $10 Target gift card to someone just walking in the doors of the store… Those things were good, but I found that they seemed a little bit awkward and forced. What brings more hope and joy and healing for me, is seeing a need and going out of the way to fill it. It is in doing more than what is expected. 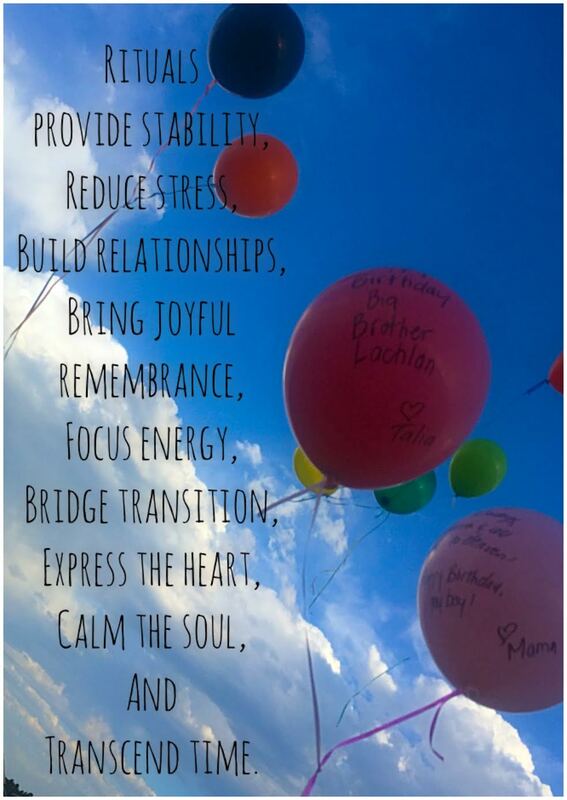 When I started building Lach’s Legacy, it was to reach out to other people, to support people in their grief, help them find some resources that may be helpful…however, in reaching out, I found excitement, joy and hope. By doing that, I was helping myself as much, or more, than I was helping anyone else. When I get to talk to a newly bereaved parent, I know it comforts them to share their story and to connect with someone who understands, but it also helps me. It gives me new perspective and fresh ideas and it helps me to remember how far I’ve come from the agony of new grief. I’m pretty sure I can feel my heart growing in those experiences. I find joy…not necessarily a happy, giddy, smiling, laughing sort of joy, but a deep and peaceful joy, when we are able to offer a special kindness to a terminally ill child and their family, when I am able to help a new student feel a little more comfortable in their environment, and when I am able to connect with someone who is working through one of life’s struggles. I get more from those experiences than I give. St. Francis of Assisi figured that out before I did. He said, “O Divine Master, grant that I may not so much seek to be consoled as to console; to be understood as to understand; to be loved as to love. For it is in giving that we receive; it is in pardoning that we are pardoned; and it is in dying that we are born to eternal life.” He was right. Compassion for myself was something that I had to learn in a new way after Lach died. 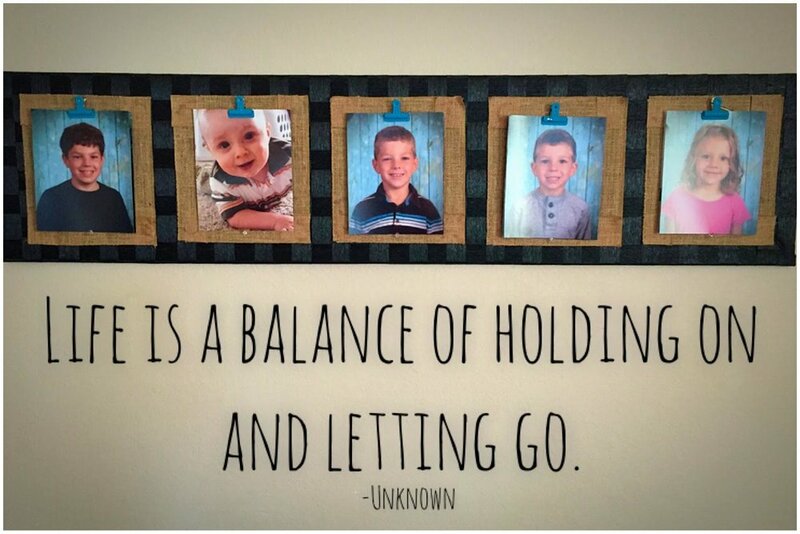 It goes very much hand-in-hand with the “letting go” post earlier this month. At first, I had to learn compassion in regard to the emotion that I was experiencing. I didn’t have much tolerance for the difficulty I had in holding myself together, especially trying to do routine things out in public. Shopping for clothes was one of those things that, for whatever reason, stands out to me. It was unbearable to look for the 3T size without needing one in the 12 month size. I fought back tears… no one needs to see this wreck of a woman standing in the children’s clothing department. Hold yourself together! Go do something else! I always seemed to lose that battle and the tears won anyway. Eventually, I think I just got tired of fighting myself. I decided to let go of the fight and allow myself to feel whatever it was I was feeling. I allowed the tears to flow whenever they came. I had to acknowledge that I was going through every mother’s hell and I had to meet myself with the same compassion and understanding that I would give to others on this path. I had to somehow trust that it wouldn’t always be like this, and I needed to give myself permission to work through those things rather try to stuff them away. Not everyone will understand. I might get a few extra looks, but that’s ok. If they knew my story, they would say that’s ok too. Shopping and church were going to bring tears and I learned to let it be… and brought along the tissues I was probably going to need. Developing enough compassion for myself to allow the craziness in my thoughts while I was working on picking up the pieces was the other part of that. At Compassionate Friends meetings, a group for bereaved parents, many people talked about how crazy you feel after the death of a child. I was glad to know that I wasn’t alone in that, and that just because I felt crazy, didn’t mean I was sure to jump off the deep end. Even now, I have thoughts that I have to treat with compassion and just let them be, without giving myself a hard time about them. When I get a phone call at work, especially when I’m scrubbed in and can’t answer it, my first thought is “I hope nobody died.” If my phone rings again, I find myself running through the scenario in my head. I know, it’s irrational to jump straight to that, but it’s happened to me before. I’m a little weird about pictures, too. Talia just had some professional photos taken. I’m excited to capture that cuteness that makes all the 3-year-old tantrums worthwhile, but I also get some sort of satisfaction in knowing that I’ll have those recent and beautiful images if she dies. It’s not in the budget to purchase all of the images, so I wonder how long the photographer keeps the files and I wonder if she would give them to me if Talia died …I know, morbid, right?! Things like that are regular occurrences in my head. They are not the average thought processes, but I suppose burying a child is not an average life event. I don’t bother other people with that mess in my head, I just try to meet myself with compassion, and acknowledge and allow the thought and then let it go. It’s not socially acceptable to think that way, so it’s not something that gets discussed much, but I don’t think it’s necessarily unhealthy to have those thoughts either. To be honest, I think we’d all do well if we spent a little more time considering death. Recognizing the finality of my own life and the life of those I love helps me to live a little more fully and to appreciate the people in my life a little more deeply—my life and theirs is a gift that won’t last forever. I once heard this quote that I really loved: “Emotions are like small children—you can’t let them drive the car, but you can’t stuff them in the trunk either.” In sudden grief, it’s like unleashing a mindful of unruly and unreasonable toddlers. They are bouncing around EVERYWHERE. Ignoring the situation won't help. Sometimes you have to stop what you are doing, acknowledge the chaos, and grapple with them one by one to put them back in their proper place. Compassion goes a long way in calming the disarray of thought and emotion. It gives you the time, the space, and the understanding necessary to allow the healing process to unfold. Carly Marie, the woman who organizes this project, says “Turning the WHY into What Heals You? has been one of my greatest healers. Whenever I found myself asking “why did this have to happen. Why me? Why him?” etc etc I started asking myself what heals me?” She became aware that it was in intentionally turning to what was healing that allowed that process to unfold. I’ve asked myself that similar question regularly, and I often ask it of newly bereaved parents too. What brings comfort? What helps? There is no ONE thing that is the mainstay of healing after the death of a child. It comes in tiny bits from many different places. The things that are the main pillars of my healing will not necessarily be what the next person needs. If you are close to a griever, you don’t have to just wonder what might help. If you ask them what you can do for them, or what they need, they’ll most likely come up blank. However, if you ask them what helps and what brings comfort, there’s a good chance you’ll get some ideas you can work with. For me, the list of things that brought comfort and healing is something like this: talking with bereaved mothers, reading and journaling, building a legacy for Lachlan, planting a garden for him, talking with friends who weren’t afraid to hear, offering random acts of kindness to others. Being able to talk to the people at his daycare who answered questions about his last day. The steady presence of family. The people who reached out to us to offer their support whether by card, attending his services, donating vacation hours or cash to his memorial fund, or helping with household jobs was all very humbling and comforting. Finding ways to let my loss bring comfort to others who are on the same path. Knowing that Lachlan and his story has somehow made a difference in someone else’s life. Prayer and an intentional effort to grow my faith and deepen my relationship with God. My rainbow babies, who have brought more purpose, love and joy into my days. Being able to talk about it with my husband, the only other person on the planet that loved him and misses him like I do. I’m not sure that true healing after the death of a child can happen without some sort of intentional movement toward that. Healing work is sometimes uncomfortable and difficult. I work in surgery, so I am reminded of the surgical wound that just won’t heal. Sometimes you have to intentionally work at getting a wound to heal and it doesn’t just happen automatically with the passage of time. It is uncomfortable, difficult, and time consuming, but you can’t ignore it. If you do, the skin might seal shut, but it leaves the perfect place for an abscess to form. The problem will not be laid to rest until it is dealt with. In order to get those tough wounds to heal properly, you have to pack it, debride it, and let it heal from the inside out. The loss of a child is like that. It is a wound that has to be healed from the inside out in order for wellness to be restored. Sometimes things like talking about the loss in a real way, or working through this project are emotionally draining, uncomfortable and take work, however, when you look back at it, you find that there is healing that happens on a deeper level and a lasting peace that comes from it. I wish __. I wish with my whole heart that no one ever had to experience the loss of a child, that there was some sort of guarantee that parents get to die before their kids do. When I hear of another child who has died, my heart hurts most in knowing what the parents are in for…how hard, how long, how much struggle will come for them in the years ahead. I remember __. I remember wanting and waiting to feel better. All the hurts I’d experienced before just seemed to fade with time. I wanted this hurt to do the same thing. It didn’t. This was a different kind of pain. Once I started looking at it as something like an amputation—a wound that forever changes the way you live—then I was able to start looking for ways to live well again. I could not believe __. I could not believe that I, as a 26 year old kid, was having to choose a place in the ground to bury my baby. Walking through the cemetery, choosing a spot, was one of the most surreal moments and it was there that I was really hit with disbelief that this is what I was doing. It wasn’t fair. It didn’t make sense. Young couples who are just starting their families don’t choose cemetery plots for themselves and their children. I am __. I am braver than I believed, stronger than I knew, and smarter than I thought. I am more humble than I used to be and more graced than I deserve. I often hear people say, I don’t know how you do it, or I could never survive the loss of a child…I didn’t think I could either. Believe it or not, you too, are braver than you believe, stronger than you know, and smarter than you think. Today’s prompt is meant to highlight the differences in ourselves before the loss and after it, and who we are becoming. I’ve said it before, and most bereaved parents will say it…I am different after losing a child. Before Lachlan died, I was able to somehow feel protected from suffering and tragedy. Bad things happened to other people. I could be sympathetic to the suffering of others, but I wasn’t touched by it in the same way that I am now. Their tough stuff remained separate from me. It wasn’t out of coldness or an intentional attitude to protect myself, but there was an innocence or a naivety that didn’t really allow me to feel the suffering of others very well. It was inexperience with how hard life can sometimes be. I was able to be happy and content in my controlled world. Then Lach died and that innocence died with him. Suffering was real, it was personal, and it was deep. I guess when a heart breaks open, it is given room to grow. Now I am able to be more open-hearted to the misfortune of others. I can more quickly move beyond a sympathetic response to an empathetic one. I want to choose a heart that remains broken if that allows my heart the room to continue to grow. I want to consciously become better at living with hope, mercy, truth, and love…always striving to be a softer, richer, deeper, wiser, and better version of myself. My message today for the newly bereaved is simply this. You are going to be ok. I know, it doesn’t feel like it. When you are in that new grief and your body physically hurts, when every single moment and thought is entirely consumed by the torment of not having your child in your arms. Your world is shattered and nothing is ok. When you hurt so much that it seems your heart should simply stop beating in your chest. When the idea of living the next 60 years on this planet without your baby is unbearable, it doesn’t feel like it can actually ever be ok again. Before Lach died, I viewed happiness and sadness as opposites. Two sides of a coin that can’t both be experienced simultaneously. I know differently now. I can be both sad and abundantly happy at the same time and because of the same event. I always miss Lach and thoughts of him are never too far away, but sadness doesn’t overpower my days anymore. Even on the days I really miss him, I’m ok. Eventually, you can be even more than just “ok.” You will be happy, fulfilled, content with this life you’ve been given, and able to be joyful with life’s experience. That’s really an understanding that only time can give you. You’ll never be the same, but if you want happiness again, it is yours for the taking, just by making choices most days that lead you by baby steps in that direction. I was really fortunate that I didn’t have anything major that came up along the way that severed any relationships. However, after the death of a child, there is a noticeable shift in relationships. Several relationships simply dissolved. Many new relationships formed. These new relationships that were built out of the loss were built on things that leave a lasting mark. There is something unique about those relationships. They are people that I feel a meaningful connection to, people who I would do just about anything for, and people who are more than just casual friends. I’ve spent some time in the last couple days reflecting on what makes those relationships unique. It isn’t time spent together, some of the people I feel closer to are people that I rarely get to see. It isn’t necessarily common losses. I do feel a special connection with many other bereaved moms, but not all of them, and I do feel particularly connected to several people who have not experienced any significant loss at all. So where is the difference made? I think the key is vulnerability and the stronger relationships are with people I’ve been able to share my weakness with. When your child dies, you are suddenly thrust into an extraordinary state of vulnerability, whether you like it or not. You are charting new territory, emotions are big and raw, and your sense of security is torn. There is always a sense that you are being watched by those around you in the same way that people can’t help but stare at the train wreck as they pass by. There is so much vulnerability in that. No matter how much you try to guard yourself, you can’t entirely do it. There are some people who pass by the train wreck, sympathetic and concerned, but who choose to keep moving. There are others who stop what they are doing, push up their sleeves and slip in beside you to help with the clean-up. Those people became vulnerable themselves by stepping into my nightmare. They chose to look this broken woman in the eye knowing that this tragedy could just as easily been their own. There was nothing I did to deserve or cause this. There was no way to prevent it and it could have been them instead of me. It takes courage to look that in the eye and not run the other direction. I think it’s exactly because of that mutual vulnerability that those special attachments were formed to those people who supported us through that loss, who looked out for us, helped us, and walked the journey with us. Vulnerability is not comfortable for anyone. It often means sharing the parts of yourself that you’re not very comfortable with, the very personal struggles, the fears, doubts, and imperfections that are part of our daily battle. 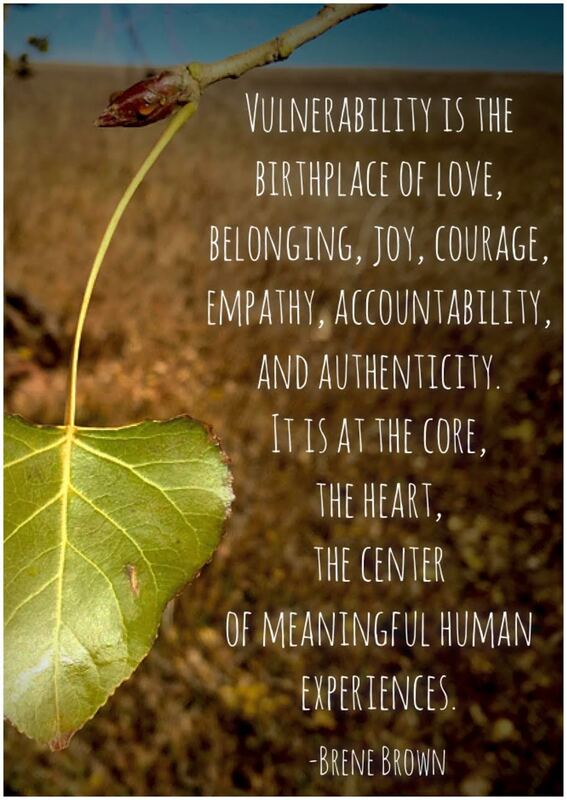 However, as uncomfortable as it is, vulnerability is the stepping stone for meaningful human connection. When you can be truly open with someone and be loved and accepted anyway, there is depth in that friendship. There is strength in a relationship in which someone else has been willing to risk their own physical or emotional stability to be with you. We have to be careful not to lose touch with what vulnerability brings to our lives. In our world of technology it is easy to let our interactions with each other take place on a superficial level. We enjoy the time together, but never really ask the tough questions and we aren’t very willing to really bear ourselves to others. It’s easier to send a text when you can calculate the response than accept the unknowns of what a real conversation might bring. On Facebook, we can share tidbits of our lives and feel like we somehow know what people are up to, but we only ever see one side of that coin. It becomes a place where we can present only the parts of us that we want to show the world. We don’t share the ugliness of our lives. We are never really vulnerable. Like the tree that needs to embrace the vulnerability of winter and let go of those last leaves in order to continue to thrive and grow, we also need to embrace our vulnerability in order to grow. It is In our weakness that our greatest strengths are found. When we can stop what we’re doing, push up our sleeves, and be courageous enough to be vulnerable, we open ourselves to meaningful relationships, and to genuine love, joy, acceptance, and fulfillment. The list of healing therapies is long. Reading, fancy coffee, hot baths, an occasional massage, or a casual walk. Cards, notes, and gifts from those who cared. Talking with a friend who wasn’t afraid to hear what I had to say, or a bereaved mom who would convey to me that I would be ok again, grief support groups. A hard run, a soft warm bed, looking through pictures of the baby I missed so much, journaling, sharing random acts of kindness in his memory, Lach’s Legacy. Creating something beautiful—a drawing for his headstone, a garden for our yard, a chest to keep his belongings. Long tearful talks with my husband, a toddler to crawl into my lap, family who sat with us in our grief. Music and poetry. Silence and prayer. …but the greatest of these is love. All of the little physical things helped me get through that particular moment, but the most healing came in the conversations, the genuine empathy, and the love of those around us. It was there that I knew we didn’t suffer alone, we didn’t remember Lachlan alone, that I was offered new hope and perspective, that I was loved enough for people to reach out and sit with me when I was shattered into a million pieces. Love, gentleness, and a willingness to suffer alongside us…that’s where the roots of true healing begin. 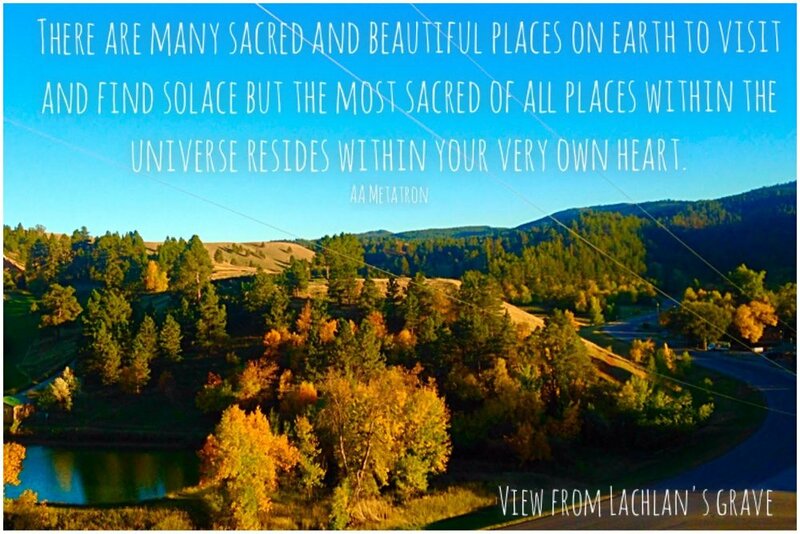 In the beginning, I felt a particular draw to the cemetery as my sacred space, a place to feel connected to Lachlan. In a way, I thought it was funny that I WANTED to go there. Our culture trains us to think of a cemetery as a creepy place. I guess some of that attitude had worked its way in to my psyche… until Lach died. Then all of a sudden, it wasn’t creepy at all. It was a place of abundant love. A place where people lay to rest those who have been most important in their lives. It was no longer the backdrop for Halloween movies, but a place that was sacred and holy, a place where love could continue to be expressed. Lach has a beautiful spot. When I was in high school, I went to the burial of the father of one of my classmates. He is buried in that same area. I remember distinctly thinking at the time that this particular place in the cemetery was stunning, and I wondered why there would be any plots left in that area. Those should have been the first ones to go! It sits above the mouth of Spearfish Canyon and all its trees, overlooking the golf course, a pond and a fountain. That summer after Lach died, anytime I could work my way up there to sit in the silence by myself, I would. It was peaceful. That was where I said my last goodbye. It was a place I could feel connected to him and work through some of that grief. Over time, that sacred space has shifted. The garden in our back yard dedicated to him and the memorial garden in Harrisburg are special spots, but more than the places you go to visit, that sacred space has moved into my heart. Lachlan comes with me wherever I am, and thoughts of him are never too far away. His existence is part of who I am. I think of him when I see a beautiful sunrise, a dragonfly, the stars, or a blooming crabapple tree. I see him in the empty space in the car, or at the table, and in the pair of soccer cleats that is missing from the pile. I see him in every 10 month old baby, in the hand-me-downs that have to be stored for a few years, in the cousins who were born the same year he was… He is always nearby. I think shifting your relationship from a physical connection to a spiritual one is some of the major grief work that has to be done. As physical beings living within the construct of time, we crave physical connections that fill our time. Saying goodbye to the physical presence of your child means saying goodbye to sloppy baby kisses, holding a sleeping baby in your arms, wiping sticky fingers, and bath time, messy meals, picking up the toys a thousand and one times, and sharing the food off your plate at every meal. A baby takes so much of your time and your physical self, that the emptiness that is left behind is unbearable. Eventually, in being able to fill some of that emptiness with meaningful activity and relationships, the ache of the emptiness starts to fade…though it’s difficult to find something meaningful enough to fill the void when the void comes from not having your own child to care for. As my time was slowly filled in more meaningful ways and the ache of my empty arms stole less of my attention, my heart could begin find Lachlan everywhere, never very far from where I am. In October 1988, President Ronald Reagan declared October as National Pregnancy and Infant Loss Awareness Month saying, "When a child loses his parent, they are called an orphan. When a spouse loses her or his partner, they are called a widow or widower. When parents lose their child, there isn’t a word to describe them." The campaign for the October 15 Infant Loss Remembrance Day began in 2002, and the “wave of light” has been adopted worldwide. If we each light a candle in memory of the infants we’ve lost at 7pm local time, then together we create a continuous wave light reaching all the way around the globe. What a cool, yet simple way, to support each other, and embrace and acknowledge that these little lives mattered and we are changed because of them. • Nearly 30,000 babies per year are stillborn in the US. Worldwide that number is 4.5 million per year. • 15-20% of all clinically recognized pregnancies end in miscarriage. SIDS is the leading cause of death for babies between 1 month and 1 year of age. Most deaths occur in babies 1 to 4 months of age and 90% of them occur before a child is 6 months old. SIDS in unpredictable and unpreventable. It occurs in both genders (in boys slightly more than girls) and across all races and socioeconomic classes. It is not due to vaccinations, suffocation, or choking. SIDS is a diagnosis of exclusion, meaning that when every other potential cause has been ruled out, then a diagnosis of SIDS can be assigned. As pointed out by the CJ Foundation: Increasingly, as the years have gone by, fewer and fewer medical examiners and coroners have been using SIDS as a cause of death. If an infant dies unexpectedly, the death may be listed as KSIDS, SUID, SUDI, SID, Cot Death, plus many more. To make it personal, Lach’s death certificate said SIDS on it, but when I had an opportunity to talk to a medical examiner who did not do Lach’s autopsy, he told me that he would not have used SIDS as the diagnosis because Lach was significantly older than the “typical” SIDS baby, though he was still under a year old. • Infants should be immunized. Evidence suggests that immunization reduces the risk of SIDS by 50 percent. • Bumper pads should not be used in cribs. There is no evidence that bumper pads prevent injuries, and there is a potential risk of suffocation, strangulation or entrapment. DO NOT RISK THE LIFE OF YOUR CHILD FOR A CUTE BUMPER…USE IT AS WALL DÉCOR, A WINDOW VALENCE, OR PUT IT IN THE CRIB TO TAKE A PICTURE AND THEN TAKE IT RIGHT BACK OUT. • Always use a firm sleep surface. Car seats and other sitting devices are not recommended for routine sleep. THIS INCLUDES SWINGS, BOUNCERS, ETC. • The baby should sleep in the same room as the parents, but not in the same bed (room-sharing without bed-sharing). I KNOW HOW AWESOME IT IS TO SNUGGLE A SLEEPING BABY WHILE YOU LAY IN BED AND HOW CONVENIENT IT IS TO NURSE A BABY WHILE ARE IN BED. MAKE SURE YOU HAVE THE OPPORTUNITY TO DO IT AGAIN THE NEXT DAY AND PUT THE BABY IN THEIR OWN SPACE BEFORE YOU ALLOW YOURSELF TO DOZE OFF. • Keep soft objects or loose bedding out of the crib. This includes pillows, blankets, and bumper pads. I KNOW WE LOVE TO SEE OUR BABIES ALL SNUGGLED UP WITH A BLANKET AND A STUFFED ANIMAL. TAKE A PICTURE AND THEN TAKE THOSE THINGS AWAY. IT IS NOT WORTH HAVING TO PUT YOUR BABY IN A CASKET THE NEXT TIME YOU TUCK THEM IN. • Wedges and positioners should not be used. • Pregnant woman should receive regular prenatal care. • Don’t smoke during pregnancy or after birth. • Avoid covering the infant’s head or overheating. WHEN MOTHERS WHO HAVE LOST BABIES COME ACROSS OTHER BABIES SLEEPING IN A CAR SEAT WITH THEIR FACES COVERED, WE PANIC FOR YOU. IF YOU COVER YOUR BABY’S FACE FOR MORE THAN JUST A FEW MINUTES TO PROTECT THEM FROM THE FRIGID WEATHER, DON’T BE ALARMED IF A STRANGE WOMAN COMES UP TO YOU AND FRANTICALLY UNCOVERS YOUR CHILD. THANK HER. I HAVEN’T ACTUALLY DONE THIS TO A STRANGER, BUT I WANT TO. • Do not use home monitors or commercial devices marketed to reduce the risk of SIDS. I PERSONALLY HAVE USED THESE DEVICES. THEY CANNOT PREVENT A DEATH, THEY CAN ONLY ALERT YOU TO A POTENTIAL PROBLEM, BUT THEY GAVE ME SOME PEACE OF MIND AND REDUCED MY ANXIETY WHILE MY BABIES SLEPT. THE WARNING FROM THE APA COMES MORE SO AS NOT TO RELY ON THESE DEVICES TO PREVENT DEATH. • Supervised, awake tummy time is recommended daily to facilitate development and minimize the occurrence of positional plagiocephaly (flat heads). Even as a mother who knows the loss, I was not able to practice these safe sleep recommendations perfectly. However, I always kept an attitude of working toward that. There were times that I was absolutely exhausted and the baby only cried if they were not snuggled up next to me. There were times that I needed to make a brief exception, and then work toward a better sleep environment the next time. Keep after it, babies will adjust to the sleeping environments that you give them. If, God forbid, your child dies during sleep, give yourself the gift of not having to wonder if you could have prevented it by following these recommendations. I find that I am offended when people that I love regularly and casually choose unsafe sleep environments and positions for their babies, simply because it's easier, their baby sleeps more soundly on their tummy, it's cute, or they just like it. Many bereaved mothers feel this way, and struggle with how to handle it. We often don't say anything, so as not to force the reality of death on another mother. I make a conscious effort to not be judgmental, every parent has unique circumstances that influence their decisions. I usually won't say anything because I am too emotionally charged, or worried that I'll seem crazy or paranoid, but I can't help but feel angry. It feels like a disregard for the significance of my loss, and though it's not my child, that unsafe sleep environment is putting me at risk for losing another child that I love, too. It is more than just the parents who grieve the loss of a child. One of the biggest ways that you can honor a mother who has lost a child is to choose a safe sleep environment in memory of the child who died. Put your child in a safe sleep environment, take a picture and send it to that bereaved mom you love. Include a note that is something like "In honor of (baby's name), we are choosing a safe sleep environment. (Baby's name) life has made a difference to us." It will be like a little living memorial! What a simple, beautiful and powerful gift. Spirituality is defined as a transcendent dimension within the human experience…discovered in moments in which the individual questions the meaning of personal existence and attempts to place the self within a broader contest of life. If there’s ever a time that an individual questions the meaning of existence and tries to figure out where they fit in the big picture of life, it will be in a time of big change. The birth of a child is a defining moment in our spirituality. A baby changes EVERYTHING. They change our lives in every way…they change our priorities, the way we use our time and money, they change our relationships with the people around us, and they change our relationship with God. The birth of a child changes everything…and the death of a child changes so much more. The birth of a child fits in with the (mostly) predictable order of life as we know it. We expect some big changes, we prepare for them, and we look forward to them. The death of a child turns all of that upside down plops you all at once onto a momentous spiritual cross-road. What do I believe? Why do I even believe that? Can I still believe that? Will I walk forward with the faith that I’ve grown up with or can I not bear to move forward? Some are going to be firm enough in their faith, that even this earthquake doesn’t shake them, some will need to stop and steady themselves for a while before moving on, and some will decide that they can’t trust the route they were on (whether that route was with or without God) and need to take a different road. I feel like I was probably one of those that needed to steady themselves before moving on. I felt betrayed, but at the same time God was the only one that could make this hurt better. I was like the angry child that is mad at mom but needs to throw their fit safely in their mother’s arms. I was hurt, I was mad, and I was broken, but there was nowhere else to go for comfort. The ONLY beacon of hope that I could find was that life didn’t really end with death. If this life here was all there was, then there wasn’t much worth living for. If there was something more beyond the grave then there was hope of being together again in a happier place. So I walked toward the only light I could find. Since then, my faith has grown tremendously, though in baby steps. I’ve gotten much closer to the place where God is really the center, and everything else revolves around that. If I don’t put that priority first, then I just might miss the whole purpose of my existence and the hope of what’s beyond. Losing Lach has been the launching pad for taking my faith seriously and not as just another thing to check off on my to-do list. I can’t help but wonder if this new growth and the deeper roots will move me into the category of being unshaken in my faith when I come to the next crisis. I don’t know. Time will tell. I’m glad I chose to continue down the road of faith. I think it helps me remember what’s really important. It helps me to love people better. It helps me to be more open-minded and open-hearted. It gives me peace and hope. I can love my life here and still look forward with all my heart to what is to come next. The only real tip that I can come up with for those standing in that cross-road is to pray. Whether you believe in God or not, just pray. Even if you can’t pray with much heart. Even if you feel like you’re only talking to yourself. Even if you don’t “feel” any response to the prayer. Keep doing it. Pray without ceasing and eventually you will find the truth you need to continue on. I once crossed paths with a very lovely gal who mentioned some bits about her time in the Peace Corps. I asked her to tell me more about her experience. She paused and then said, “It was such a big experience that it’s really hard to talk about.” And she left it at that. She didn’t try and I believed in that moment that it was a big, life-changing experience. Wow. That is perfect. That fits impeccably with trying to talk about the loss of a child. It is such a big experience, that it’s really hard to talk about. When people don’t talk about it much, it’s not because there’s nothing to say, it’s because there’s too much to say. There is no succinct way to discuss such a big loss. If I run into someone who wants to acknowledge the loss and discuss it in a brief conversation, I always find my attempts are inadequate. I can’t do it justice. I feel like I give the impression of a tidy little package neatly tied with a bow, and that’s not how it is. Trying to discuss it briefly is like standing in front of a giant sequoia and having someone ask you to describe the entire forest. For a new griever, they are just trying to figure out this foreign place for themselves so it can be nearly impossible to talk about well. For someone who’s been at it for a while, there are so many nooks and crannies, so many different avenues that could be discussed, that it’s hard to do. If you really want to know about the forest, you’ll need a genuine interest and a lot of time to give. This Capture Your Grief project breaks the experience into bite sized chunks. It gives you the opportunity to discuss several different avenues in a pointed way, and as you’ve seen by my ramblings, there is no shortage of things to say on any of them! Even with these bite sized prompts, I have to figure out which direction to take it and how to limit it to a reasonable length. There are still so many parts that can’t be seen in these snapshots, but it does give the opportunity to talk about it in a more detailed way. Making lemonade out of the lemons is partly how my brain works. When something is awful, after I’ve complained about it a bit, I’ll start looking for the silver linings. I have to. Otherwise the negative experience is for nothing. While we all need a moment to acknowledge the crappiness of any given situation, if you allow yourself to marinade in nothing but the bitterness, that’s exactly the flavor your life and your personality will take on. I didn’t want to become bitter because of my loss. After Lach’s death, sometimes the silver linings were little things…the ability to sleep soundly (even though it took me forever to fall asleep) or losing that 10 lbs that I didn’t really want anyway (even though it was enormous stress that kept me from eating). I was tremendously humbled and blessed by all the people that reached out to support us during that time. People gave so generously of their time, their money, their vacation hours, their thought, and their prayer. There was simply no adequate way to thank people like I wanted to. It didn’t take long for me to see that response from others as the hands of God reaching out to hold us during that time. That was Him, finding his way to us, through you. Each individual act of kindness and compassion was like a drop that, when combined with the others, created an enormous wave of support. To experience that first hand was part of the lemonade. I truly believe I am a better person because of my loss. I still have plenty of work to be done, but I am more empathetic to others in their struggles. I have more peace. I am able to be more confident in taking care of my own needs and the needs of my family with less pull from outside pressures. I have a better understanding of what really matters in this life. I have a better appreciation of the temporary nature of our existence. The people in our lives and the situations we are in will not last forever, so I make an effort enjoy the people and things that I love while I have them. I met others who made lemonade after their losses and taught me that it was possible. 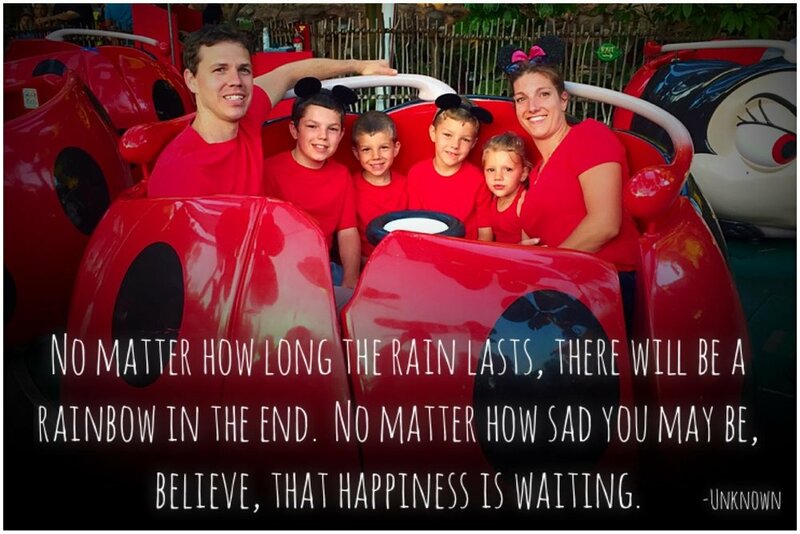 Lach’s Legacy is my lemonade stand…this Capture Your Grief project is a lemonade stand. Making a connection with a bereaved parent, the little notes that acknowledge that a care package, a connection, or that sharing my experience out loud has somehow made a difference—those things, like a little packet of sugar, sweeten the deal.